Five years ago my then Neighbour Duncan Howells suggested starting a girls football team so that summer the “Wildcats” were formed. During the following years came up’s and down’s, thankfully mainly up’s!!! these included, league runner’s up, cup final runner’s up and league winners and finally last season the wildcats won the league and cup and went the whole season undefeated. Over the 5 years the team has shown great spirit and has always been well received by other teams. 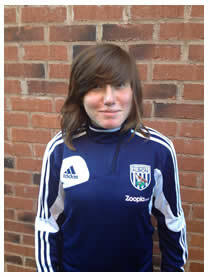 During the summer holidays Lucy went on a soccer camp run by WBA to kill some time during the holidays and also keep her playing football. On the 2nd day of the camp Lucy was asked to go back for 3 weeks to train with the U15 Girls Centre of Excelence team, she was also evaluated in a match away at Lincoln, she was then invited to signed to play for them as a goal keeper. Both myself and Lucy will miss been a part of Droitwich Spa Boys & Girls as it has been a big part of our life for the last 5 years but Lucy is relishing the opportunity and as we are both Albion fans we are of course delighted to be at WBA. Lucy’s great, great, great great Grandad played for the Albion many years ago so we are thrilled that she is the 2nd Loach to pull the shirt on. Lucy & I would like to take this opportunity to wish the Wildcats all the best for the future and espescially thank Duncan who has dedicated so much time and effort not only to the Wildcats but the club over the years, on free weekends we wil be along to watch and cheer on!